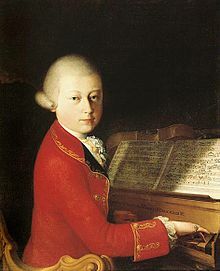 Wolfgang Amadeus Mozart began his series of preserved piano concertos with four that he wrote at the age of 11, in Salzburg: K. 37 and 39–41. The autographs, all held by the Jagiellonian Library, Kraków, are dated by his father as having been completed in April (K. 37) and July (K. 39–41) of 1767. Although these works were long considered to be original, they are now known to be orchestrations of sonatas by various German virtuosi. The works on which the concertos are based were largely published in Paris, and presumably Mozart and his family became acquainted with them or their composers during their visit to Paris in 1763–64. The first movement is based on the initial allegro of the sonata for keyboard with violin accompaniment (Op. 1, No. 5) by Hermann Friedrich Raupach, from a set of six published in Paris in 1756. The provenance of the second movement is unknown, although Eric Blom, the editor of the 5th edition of Grove's Dictionary (1954), suggested that it was in fact by Mozart. The final movement is based on the first movement of the sonata, Op. 2, No. 3, by the Strasbourg-based Leontzi Honauer. The first and third movements are again from Raupach (Op. 1, No. 1), whilst the slow movement is based on the opening movement of Johann Schobert's Op. 17, No. 2, a composer admired by Mozart. The first movement is based on the initial movement of Honauer's Op. 2, No. 1. The second on one by Johann Gottfried Eckard (op. 1, no. 4 ), the most famous keyboardist of his day. The third movement is based on C. P. E. Bach's piece La Boehmer, published in the early 1760s. Mozart's cadenzas for the concerto survive. As all the movements of this concerto are in either G Major or G Minor, the work is homotonal. In only four other piano concerti by Mozart are the slow movement in a minor key (K. 271, K. 456, K. 482, and K. 488. This concerto also opens in triple meter, an unusual feature of Mozart's 27 Piano Concerti; only K. 41, K. 413, K. 491, and K. 449 open in triple meter. The first and third movements are based on ones by Honauer (Op. 1, No. 1), and the middle one on Raupach (Op. 1, No. 1). By comparison to Mozart's later concertos or even to those of J. C. Bach, these are slight works. The preludes that Mozart added to the sonatas do not contain a wealth of themes, as is typical for his later efforts, nor does the exposition or middle section add new thematic material. The role of the keyboard as soloist or continuo is not always clearly delineated. Nevertheless, some traces of his later structures can be detected: for example, the relative sizes of the sections is approximately similar, albeit on a smaller scale. ^ a b Stanley Sadie (2008) "Mozart: The early years"
^ a b c d Hermann Abert (2007) "W. A. Mozart"